Bidens frondosa is an annual, 20 cm to 1.2 m tall, generally hairless, stem often purple, especially if water stressed. Leaves opposite, pinnately compound, stalks (petioles) 1-6 cm long, leaflets 3-5, to 10 cm long, 3 cm wide, narrow, toothed, the terminal leaflet stalked. 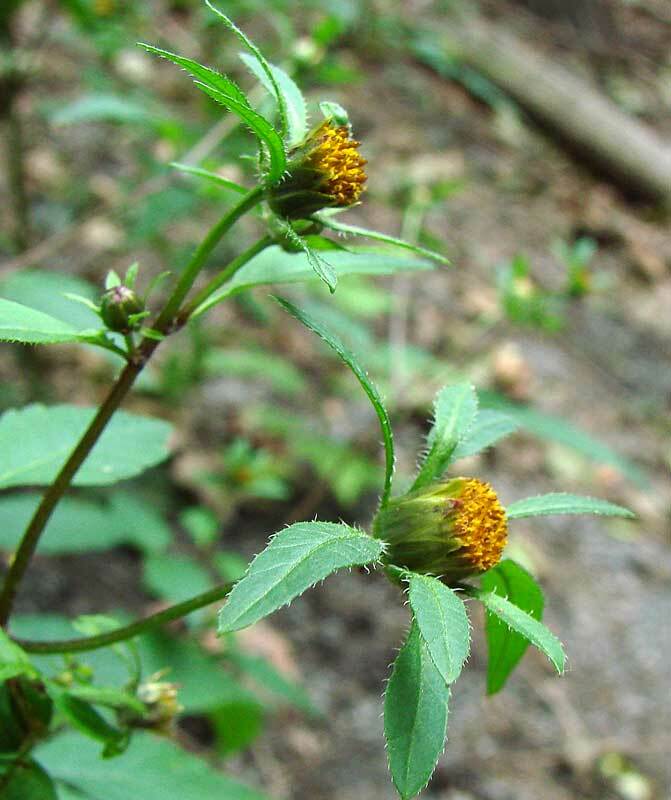 Bidens frondosa.nova Scotia Wild Flora Society.nswildflorw.ca (12/2014). Flowers yellow, heads small, rounded, rays few if any, disk orange, to 1 cm wide, stamens black, longer than disk flowers, outer bracts 5-10, (usually 8) green, leaf-like, margins hairy-fringed, longer than disk, inner bracts flat, scale-like, blooming and fruiting June-Oct.
Bidens frondosa fruit. 2011 © Peter M. Dzuik. Minnesota Wildflowers. 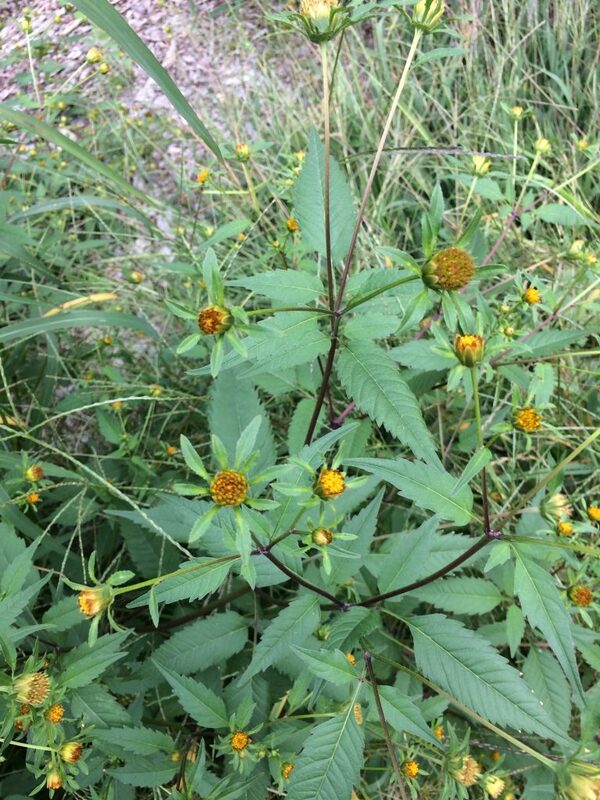 minnesotawildflowers.info (Accessed 11/2017). 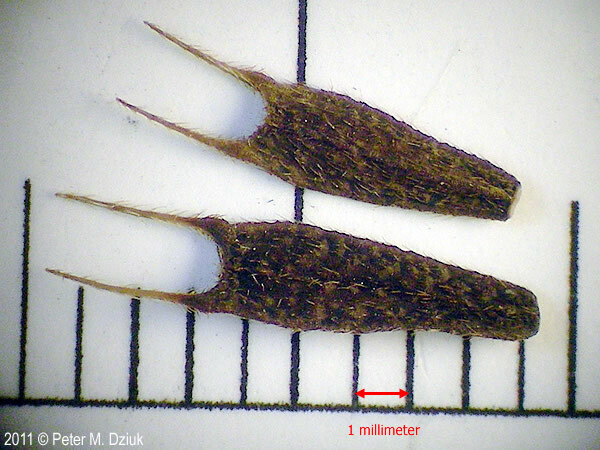 Fruit dry 1-seeded achenes, flat, 0.5-1.0 cm long, dark with 2 barbed awns. Seeds eaten by birds, plants eaten by rabbits (Martin et al. 1951). Habitat: Wet, open areas, edges, disturbed soil, pH 5.2-7.2; shade tolerance moderate (USDA 2006).